Every summer, we travel to France to visit my mother. A few days in Paris are always part of the itinerary, either before or after we head down to the Loire Valley. We plan a few activities, but our favorite thing to do is stroll the Paris streets, ready to be seduced by the warm smell of baguettes or the invitation of a crepe maker. 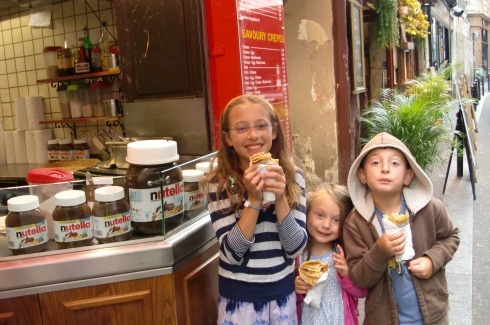 One crepe is never enough for the Druckman kids. I’ve learned over time to not leave dinners to chance. Paris is too much of a dream city to risk a bad dinner, and many restaurants will actually turn away families with children. Parisian restaurants typically only do one sitting per night, and a table of loud American children could turn other diners away. Instead of getting offended, appreciate the honesty. Dinners out with the kids can be stressful enough without factoring in an unwelcoming staff. Long before I pack up our suitcases, I research new restaurants that will guarantee a great meal for the whole family after we’ve returned to our favorite Paris restaurants. Near Notre Dame, right after sunset. 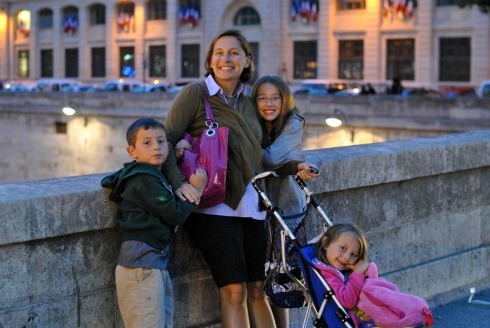 A new little guidebook came out this year, written by an American mom of three who has lived and traveled extensively in France. 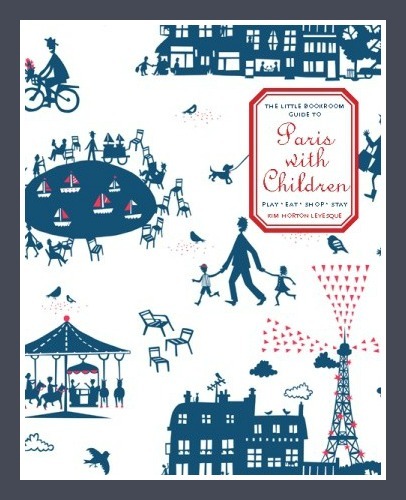 The Little Bookroom Guide to Paris with Children: Play, Eat, Shop and Stay by Kim Horton Levesque is notebook sized, and filled with a lifetime of tips. Levesque not only has great restaurant reservations, she also shares hotels that have rooms big enough to accommodate families of four (a rarity in Europe! ), cute shops you don’t want to miss, places to go if your children get sick, and activities children of all ages will love. The book is arranged just like Paris, by arrondissement, and is small enough that it will fit right in your purse. Trust me, this is a resource you’ll want with you every minute. This summer we’re actually skipping Paris, and heading straight to the South of France before finishing with a few days in Italy. I’m on the lookout for great family guidebooks to make our new family adventure a success. If you have any suggestions, please share!